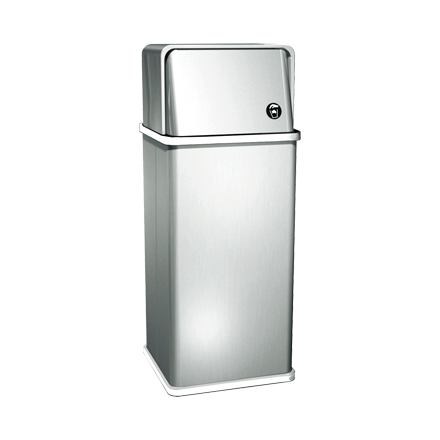 Holds more than 19 gals [73 liters] of waste material. Receptacle includes two continuous vinyl wall protectors, top and bottom, around entire perimeter. Top is removable for easy maintenance and has two swing doors hung on heavy duty spring loaded stainless steel multi-staked piano hinges to return doors to closed position. Bottom of receptacle is equipped with four (4) non-removable rubber supports. Each door includes the international waste symbol affixed to it.